In 2006 member states took a significant step in strengthening human rights as one of the three pillars of the United Nations and established (with General Assembly resolution 60/251) the Human Rights Council as the UN’s apex human rights body. Since then the Council has grown significantly in confidence and stature, as have its mechanisms. However, it remains a young body and it is clear that the first decade of its existence – its ‘formative years’ – will make a major contribution towards determining its future relevance, effectiveness and impact. Like those policymakers who steered the adoption of resolution 60/251, the Council’s institution-building package, and the outcome of the body’s five-year review, the current generation of diplomats, UN officials and other stakeholders bear an important responsibility to use the milestone of the Council’s 10th anniversary as an opportunity to step back and make an honest appraisal of the nascent body’s achievements and challenges, and identify new and innovative solutions to equip it to better meet those challenges in the decades to come. 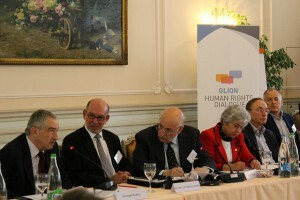 The Glion Human Rights Dialogue 2015 was a retreat-style event, hosted by the Governments of Norway and Switzerland with the support of the Universal rights Group, bringing together around sixty senior policy-makers and other stakeholders in an informal, non-attributable setting designed to promote open, forward-looking and solutions-focused debate. The Dialogue was designed to provide a platform for representatives of states, OHCHR, the wider UN, and other key parts of the human rights system such as Special Procedure mandate-holders, members of Treaty Bodies, and NGOs, to offer their assessment of the key challenges they face and their vision of how to best overcome them to strengthen the Council and the wider UN human rights system. The outcome will be summarised in an informal document presenting some of the key messages, ideas and recommendations, which will seek to encourage and contribute to wider consideration of the issues.